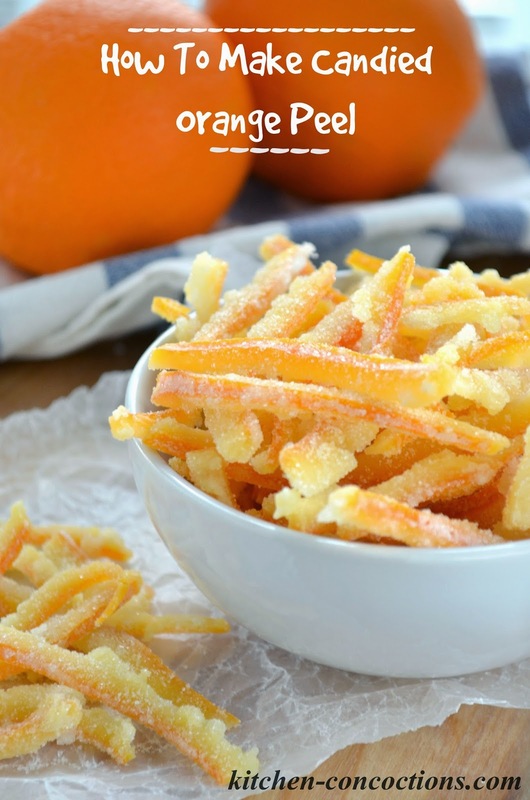 Making delicious, tart candied orange peel is simple and super satisfying! Follow the easy, step-by-step directions below and have a sweet, all natural, homemade candy in no time! I’ve mention several times that for my “day” job, that I teach cooking classes. This is something I love, and while teaching kids can fun and rewarding, it’s the adult classes that really challenge me. Not necessarily are the recipes I am teaching super difficult, in fact most of what I am teaching are basic cooking skills (things like knife skills, baking, etc. ), but often when teaching adults, there are a wide range of cooking abilities in these classes so I have to make sure my teaching points will help all the students in the class. Not to mention, adults can throw a variety of questions at you, so I am always having to think on my feet! But like I said, I love it! In one of the my recent cooking classes, I taught how to make candied orange peel. I was super excited about this class because making candied orange peel is not something I do on a regular basis. I enjoyed practicing and perfecting this technique at home and then teaching this skill to my cooking class students! Today I am sharing step-by-step directions on how to candy orange peel. This is not a super difficult technique but there is quite a bit of time involved. Luckily most of this time is spent just letting the orange peel simmer on the stove top, so you can do other things while it is cooking away. 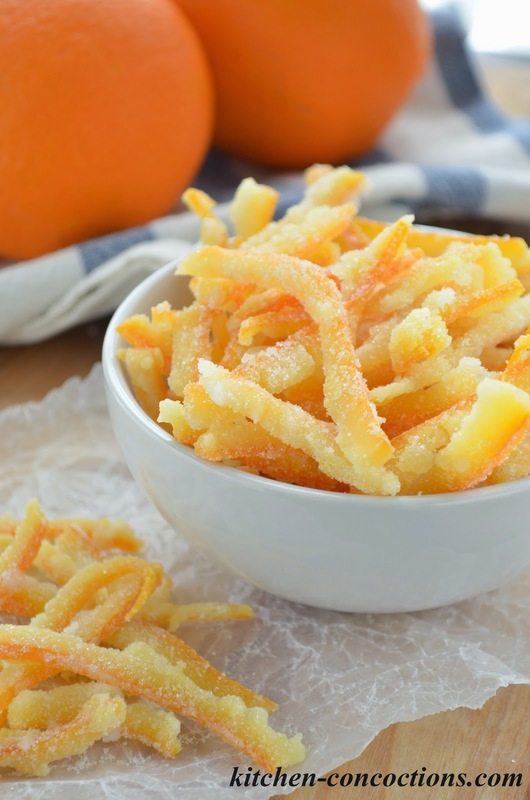 These candied orange peels are a great homemade treat or can be used to garnish a decadent dessert (like the recipe I am sharing later this week… so stay tuned)! And don’t worry the candied peels can be made well in advance and keeo for up to two weeks. 1. Rinse and thoroughly dry oranges. 2. 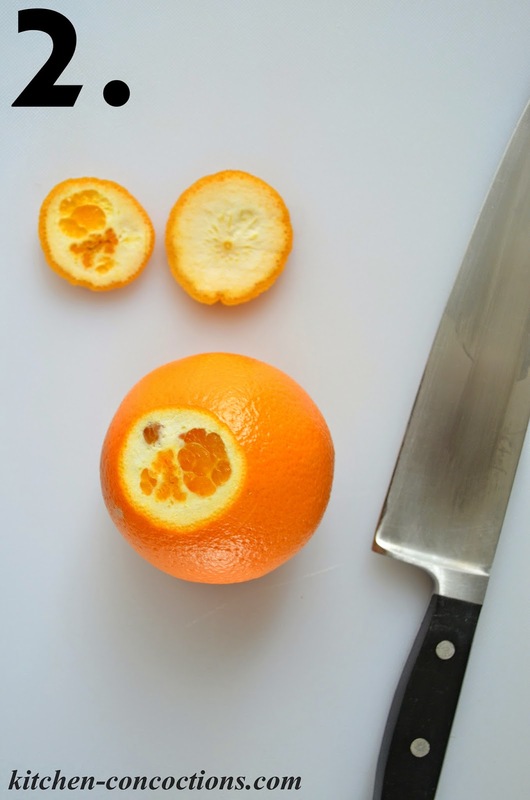 Using a sharp knife, cut the top and bottom off each orange. 3. Next, score the skin of the orange in four sections. 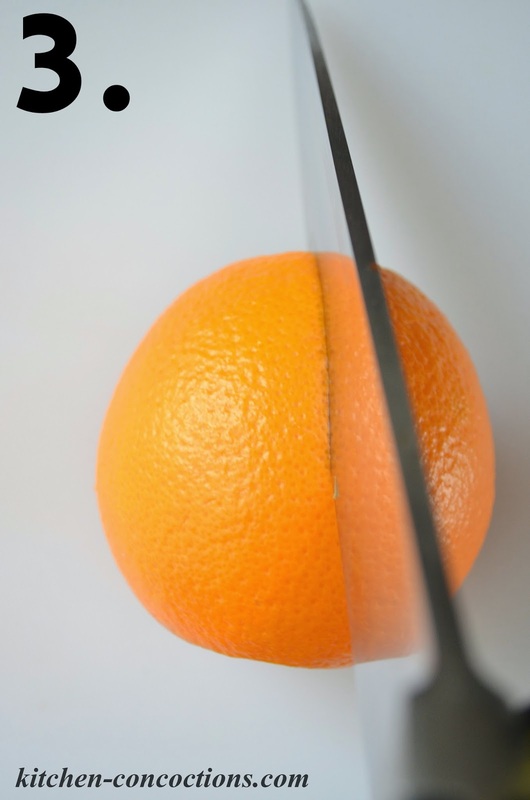 Do this by making four cuts along the curve of the orange from the top to the bottom. Use caution to cut through only the peel and not all the way through the orange. 4. 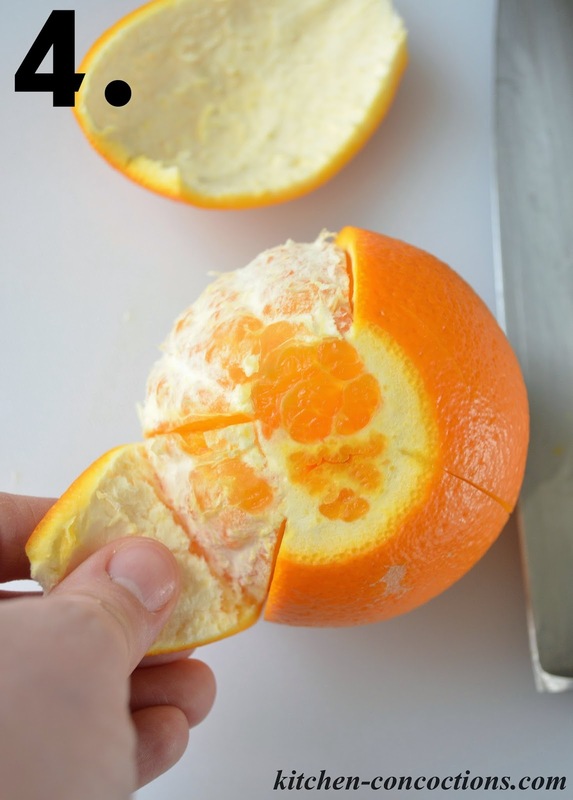 Carefully remove the skin (peel and pith) in sections, making sure not to tear them. 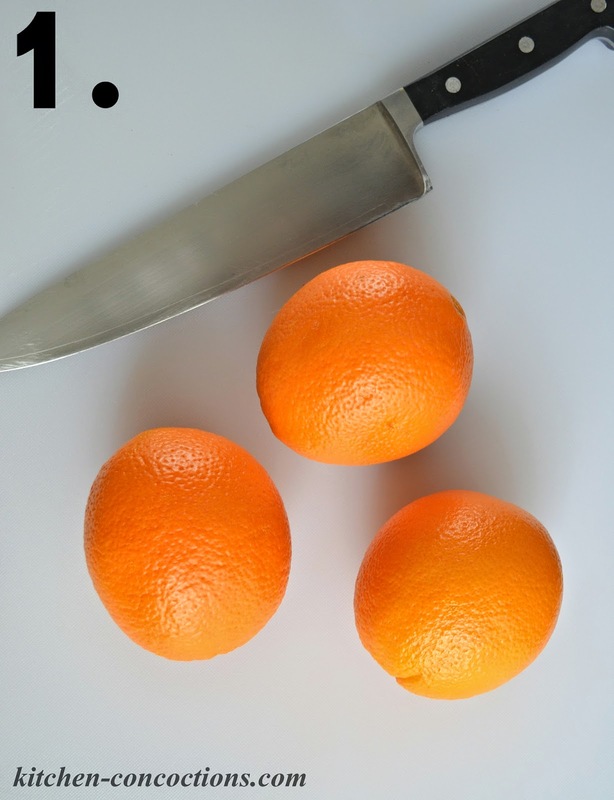 Wrap the remaining oranges in plastic wrap or place in a plastic baggie and store in the refrigerator for another use. 5. 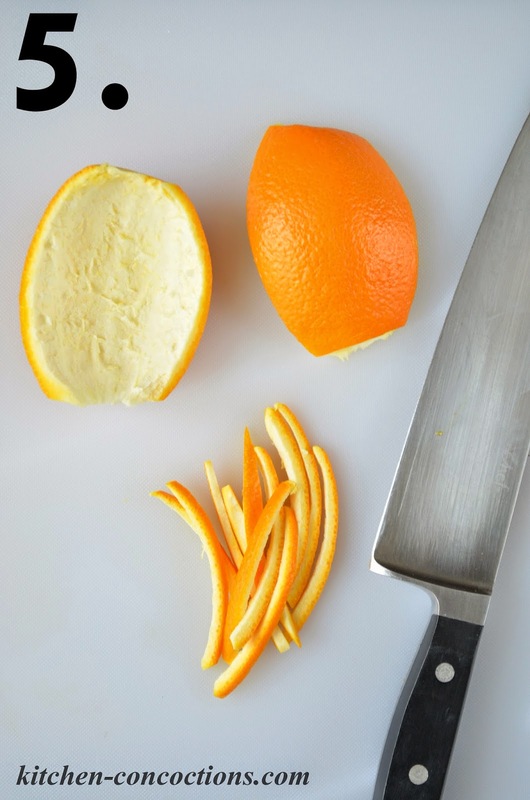 Cut remaining peel into ¼-inch wide strips. 6. 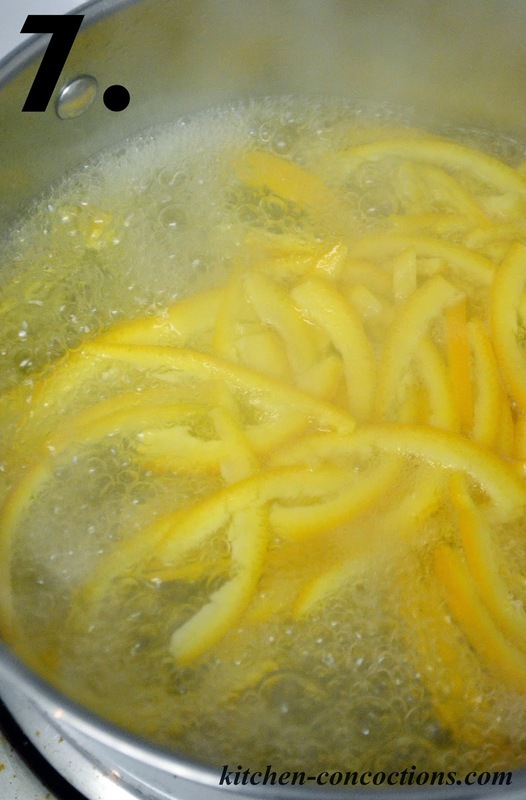 Place the strips of peel in a large saucepan and cover with cold water. 8. After the third time for the water and orange peels to come to a boil, drain and leave orange peels in the strainer. Set aside. 9. Meanwhile, in the same large sauce pan, stir together one cup each sugar and water. Place pan on burner over medium heat. 10. 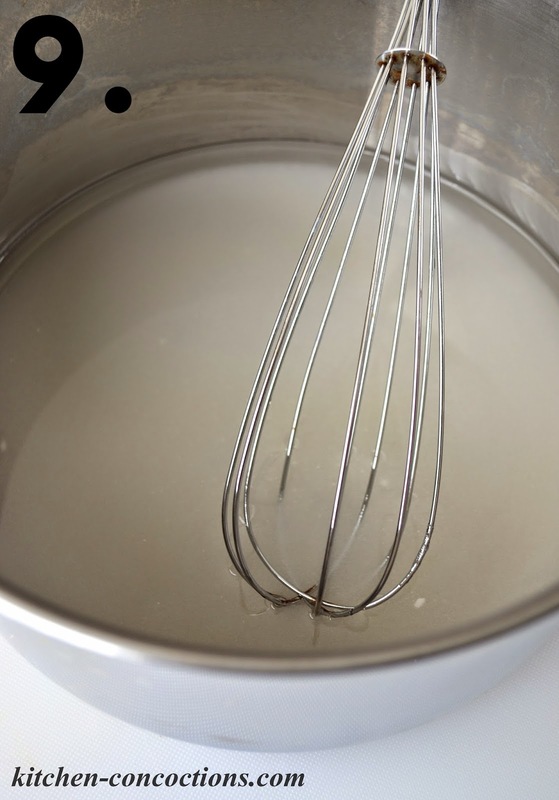 Bring sugar water mixture to a simmer and cook for 5-8 minutes, stirring occasionally, until the sugar is completely dissolved and a clear syrup forms. 11. Add the orange peel and cook for 45 minutes to 1 hour, adjusting heat as necessary to maintain a constant simmer. Once the orange peels have been added, avoid stirring, as this will cause crystallization. 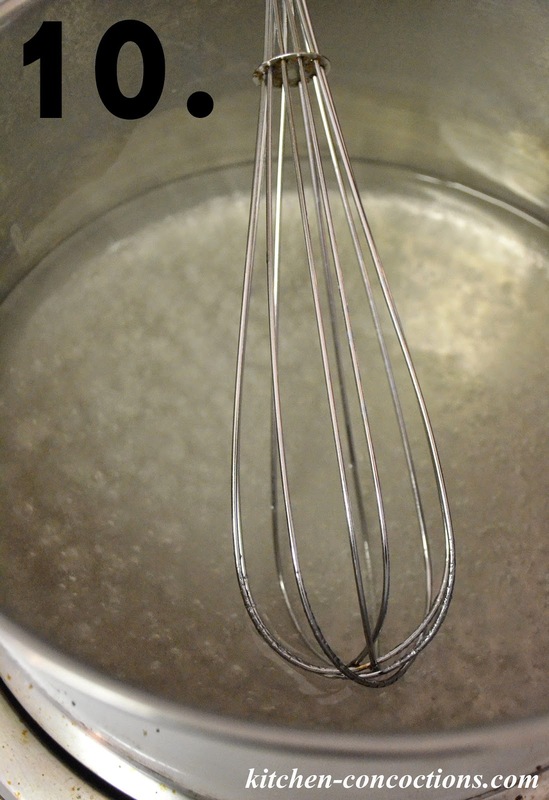 If necessary, swirl the pan once or twice to make sure that all of the peels are covered with the syrup. 12. Meanwhile, line two baking sheets with wax paper and place a wire cooling rack on top of one baking sheet. 13. 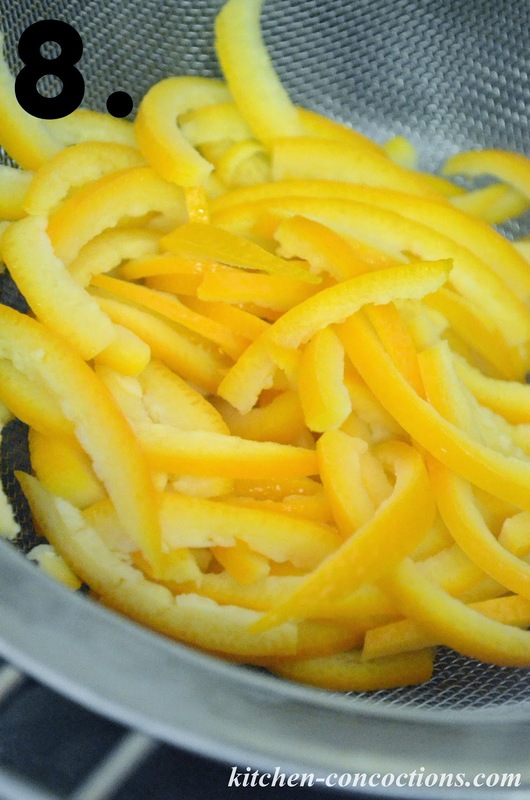 After the peels have cooked for 45 to 60 minutes, use a fork to scoop the orange peels out of any remaining simple syrup and place in a single layer on top of the wire rack. 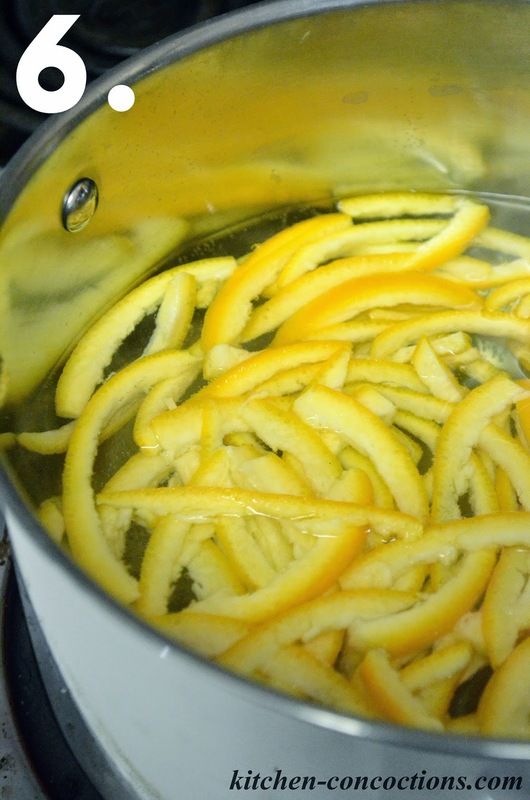 Let candied orange peel drip dry for 30 minutes. 14. 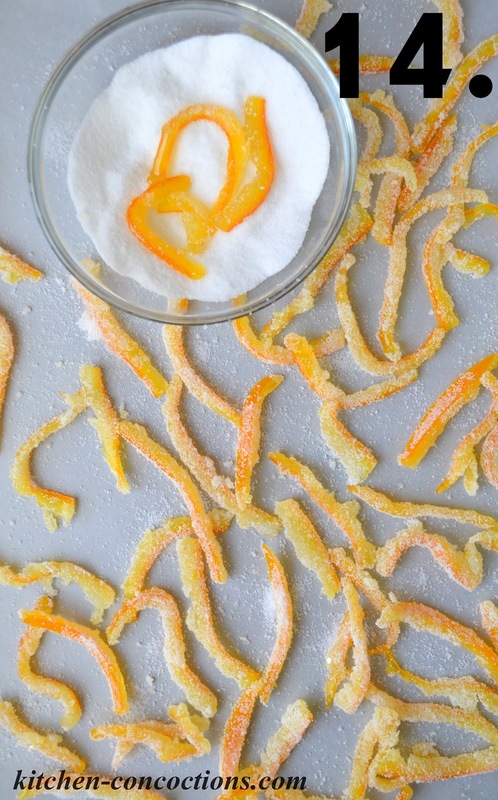 After drying for 30 minutes, roll candied orange peel in reserved 1/3 cup granulated sugar. 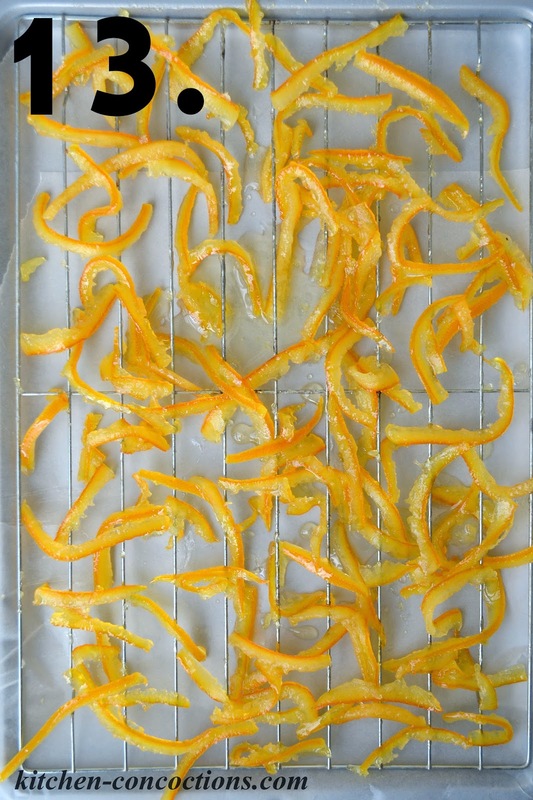 Place sugar coated orange peel on the second wax paper lined baking sheet and let dry completely at room temperature, for 6-8 hours or over night. Store candied peel in an airtight container at room temperature for about two weeks. Tart, all natural homemade citrus candy; perfect for a sweet treat or impressive dessert garnish!